REVIEW | Candoco Dance Company : The Show Must Go On. I'm always SO excited when the time comes round for Candoco Dance Company to present their latest work to an audience. 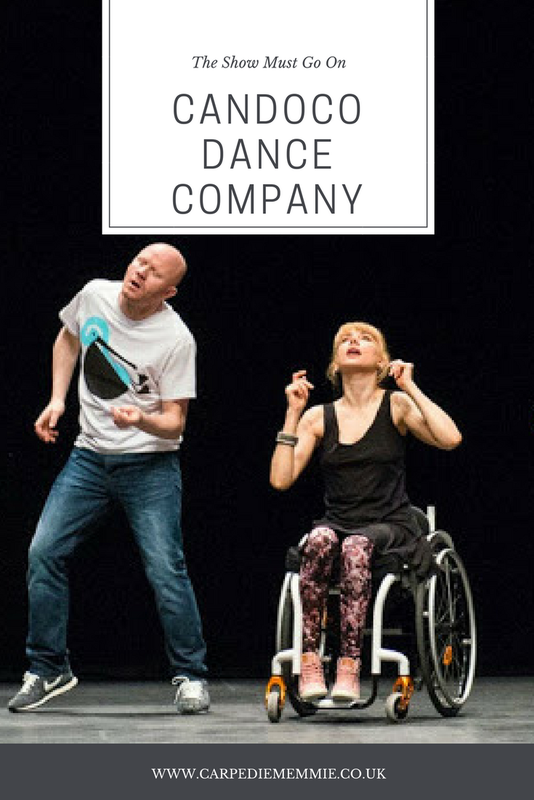 As somebody who is keen to develop within inclusive dance & diversity in the dance sector, companies like Candoco offer an glimpse into what is already there for us to enjoy and to celebrate. 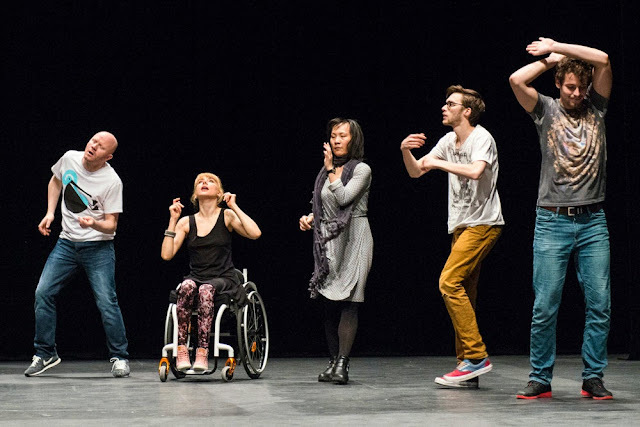 This evening at Nottingham Playhouse Candoco Dance Company presented Jerome Bel's The Show Must Go On. A piece of work I am familiar with after it was used as a research task way back in second year of university as part of the performance projects. I was always so keen to watch the piece live, so articulately and brilliantly humerus with a honest relationship with us as performers to our paying audience. I couldn't wait to see how Candoco presented the iconic work to us in Nottingham. I absolutely loved it from the very moment the lights went down, the DJ playing an iconic song from the musical West Side Story (i'm sure you'll guess without me even telling you!) which perfectly set us up for a show we wouldn't forget. The show centres on popular music and our reactions to it as individuals, so natural and at moments in complete harmony as a collective audience. There were even moments when a few lines of the audience were singing so comfortably together, there was no boundaries or restrictions to how you reacted. The 19 pop songs included in the piece are suitable for every individual in the audience, regardless of your age there was something we all knew, and oh the collective memory it created for us. I found myself drawn to memories of family discos and the dances I used to do back at dance school. The DJ at the front of the stage, the conductor, guiding us through each music and through various emotions throughout the work. The 20 performers from a variety of different backgrounds and some of which are familiar faces amongst the dance community drew me in with their own individual characters and reactions to the musicality of the performance. It looked like the most fun performance to be a part of and there wasn't a specific routine to keep up to, it was individual and creative. There were real key moments for me like the use of Every Breath I Take where each performer stood at the edge of the stage as they looked out towards us in the audience. It was one of the moments when we as audience and performers aligned together in the performance space, in harmony. I was not disappointed, I came out with a real feel good factor from such a wonderful, professional performance. What a fun, creative, feel good piece of work Candoco presented to us in Nottingham and I was so glad to witness it, I'll be definitely watching it again tomorrow to see how a different audience reacts to the journey we're taken on. You should definitely give it a watch & the Show MUST definitely go on! Lovely post Emma, sounds like a great production! Do you actually dance yourself, and what dance styles do you like most?